Reggie Fils-Aime discusses the challenges of marketing four different systems, but believes that they can all coexist - for a while, anyway. Watching Nintendo's fortunes ebb and fall lately is a little bit like Jeff Bridge's words of wisdom in The Big Lebowski: "strikes and gutters, ups and downs." 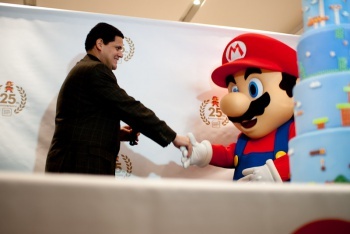 For the moment, Nintendo seems to be riding high on Skyward Sword sales and the promise of Mario Kart 7, but Reggie Fils-Aime, president and COO of Nintendo of America, has plans to keep the momentum going. With the upcoming launch of the Wii U, Fils-Aime believes that each of Nintendo's four systems - the Wii, the Wii U, the DS, and the 3DS - can share the same market space for some time as long as they appeal to different demographics: core gamers, lower-income homes, and small children. "We think the DS is going to sell well this holiday season," says Fils-Aime. "It's going to appeal to a different consumer ... For a parent with a 5 or 6 year-old, maybe that's the first handheld you buy them." The president believes that the Wii, too, will benefit from a lower price point in the coming month. "This is the first holiday that the Wii is available at $149.99 or below, so its (sic) an expanded demographic we're reaching. These are consumers who have heard about Wii for the past couple years, but at $199 or $249 it was economically out of their reach." In the grand scheme of things, an extra $50 may not sound like much, but for many families - especially with the financial burden of small children - it could be the difference between affording a console and having an extra much-needed night out. When questioned about the Wii U and the 3DS, Fils-Aime turned his attention to Nintendo's occasionally-faithful core demographic. "The consumer buying Wii hardware today is going to be a different consumer than the one who will be buying Wii U in the future ... We haven't announced pricing for Wii U, but you can definitely expect that pricing is going to be different and that the games are going to be different." Films-Aime suggests that both the Wii U and the 3DS will aim to deliver more "dedicated" experiences. Given that the Wii's unprecedented success was due largely to the casual boom, it's difficult to say whether the core demographic still has much invested in Nintendo, but if recent 3DS sales are any indication, gamers may still have a lot of faith in the house of Mario. Nintendo's sales during the holiday season will be telling, but not nearly as much as the continued prospects of the 3DS and the eventual launch of the Wii U. If Fils-Aime's predictions come true, Nintendo could be sitting pretty once again, but if not, his reaction could be very, very different.